This current Young Men’s Division song was launched on July 20, 2006 at the 62nd Headquarters Leaders Meeting to commemorate the 55th anniversary of the formation of YMD. This song retains the music of the earlier Young Men’s Division song “Challenge New Frontiers” which was originally composed in 1973, and features a new title and lyrics. The inaugural ceremony of the formation of young men division took place on the evening of Wednesday, July 11, 1951 in the small, spartan Soka Gakkai Headquarters building in Nishi-Kanda. Some 180 valiant young men gathered around their mentor, President Toda. Following a number of vigorous, youthful determinations from participating members, President Toda at last rose to speak. His first words took the audience completely by surprise: “The next president of the Soka Gakkai is certain to come from among those of you assembled here today.” Saying that he wished to pay his deepest respect and veneration to that individual, he bowed low. A hushed, awed atmosphere filled the room. Those present were exhilarated by this astonishing pronouncement… The birth of the young men’s division was also a solemn rite foretelling the passing of the baton from the second president to the third president. President Toda stressed that kosen-rufu is a mission that he must fulfill without fail and he hoped that each of his disciples would awaken to their sublime role in this endeavour. Their mentor’s firm determination to realize kosen-rufu became the vow of each of them, young men of profound mission, and resonated throughout their lives. In any era or country, it is always the passion and power of the youth constructs and opens up great achievement. The great accomplishment of kosen-rufu will not be possible without the determination of the young revolutionists fighting with the spirit of “not begrudging one’s life”. Therefore, youth, awaken to your noble mission. That was President Toda’s cry and desire. That is also President Ikeda’s wish. This new YMD song, embodying the spirit of the YMD, will accompany the youth division to achieve victories after victories. 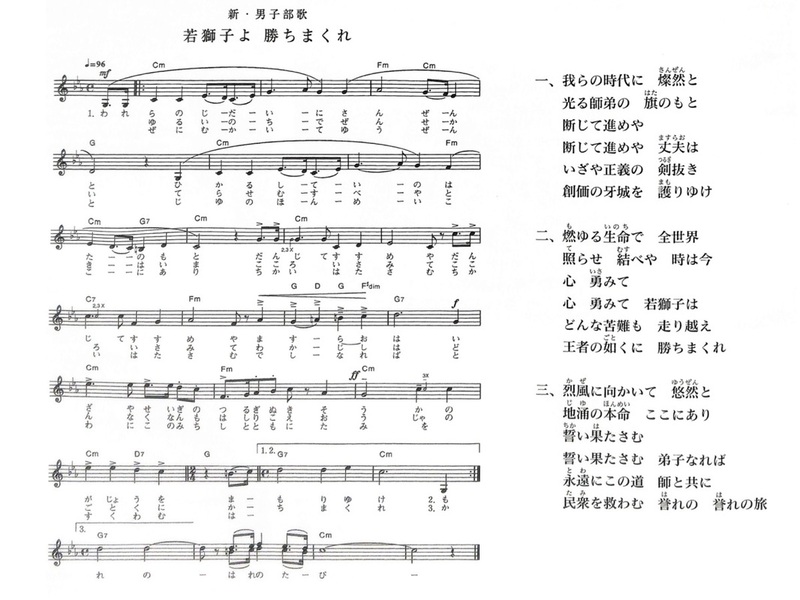 “I can’t help but feel that both these enduring melodies – 'Song of Crimson' and 'Young Lions, Be Victorious' – are a symbol of the unity of the Young Men’s Division, who will shoulder the future of the Soka Gakkai in the 21st century, and the golden pillars of the Men’s Division, who have opened the way for our present development. You are all young lions. Whatever happens, therefore, just keep forging ahead with pride, confidence, and optimism.